The treatment of melasma and post-inflammatory hyperpigmentation is a hot topic for medical and esthetic professionals, and it can be extremely challenging to treat. Most skin disorders are stressful enough, but facial skin disorders cause considerable embarrassment and often leads to depression. Being on the front lines, you experience this on a daily basis. Your clients look to you in desperation for a solution. Melasma and hyperpigmentation are stimulated by sun exposure and hormonal factors. The results are abnormal pigment darkening when an excess of melanin (the brown pigment that causes normal skin color) exists and forms deposits in the skin. 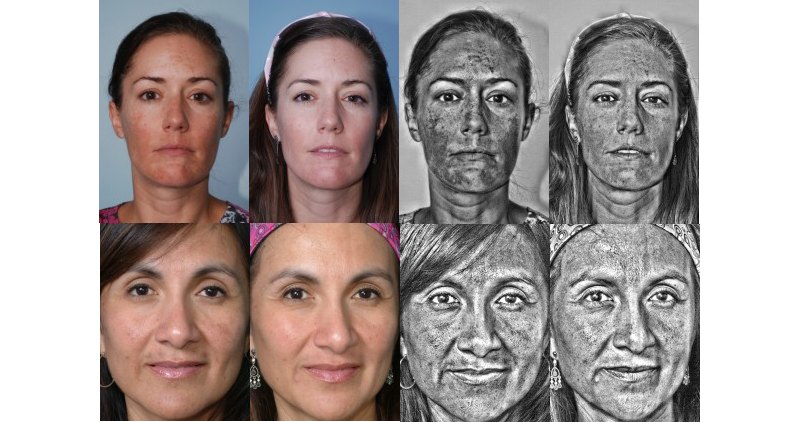 Melasma affects 25% of women and 5% of men. It is medically recognized that vitamin C, in the form of ascorbic acid, is a powerful antioxidant. Once penetrated, it works beneath the surface of the skin to strengthen the skin’s barrier while promoting collagen and moisture. This leaves skin radiant and smooth while decreasing the signs of hyperpigmentation and melasma. But vitamin C alone cannot penetrate the stratum corneum (the outermost layer of the epidermis). In fact, typically no greater than 5% of creams or lotions that are applied to the skin penetrate the stratum corneum, which is a lipid rich, highly resistant barrier to chemical agents penetrating the skin. Enter the science of Iontophoresis, which is a technique of introducing ionic medicinal or nutritional compounds into the body through the skin by applying a local Micro DC electric current. Clinical studies were done proving the successful short-term and long-term treatment of melasma and post-inflammatory hyperpigmentation. Sagging skin and other signs of degenerative skin conditions, such as wrinkles and age spots can also be treated using this technology. Created by a team of scientists, the dĒp Patch™ system now brings this revolutionary new technology to medical spas and day spas. Micro current delivery is used as a non-invasive method of transporting our proprietary highly potent 20% vitamin C serum into the skin utilizing low direct electrical current with little to no sensation. Results show 300% more penetration into the epidermis than topical application alone, allowing for maximum benefits and results. Clinical studies revealed that patients who used the direct micro current dĒp Patch™ technology with vitamin C experienced 75% improvement. Patients were advised to follow strict sun avoidance with this study to maintain improvements. Results are lighter, brighter, firmer, radiant skin. The dĒp Patch™ system is incredibly easy to use, and there is a patch to target the sensitive eye area as well as a full facial mask. Best practices show that two treatments per week produce the best results. The first 60-minute session can be done in your day spa, and 30-minute follow-up sessions can be done in your spa or in the privacy of your client’s home. dĒp Patch™ products are available exclusively for skin care professionals. The dĒp Patch™ system is the only technology in the world that incorporates a fully reusable, enhanced micro current in a patch to rejuvenate the skin. Our products utilize components and materials that have been extensively tested for safety, biocompatibility and effectiveness on more than 1,000 subjects to reduce the appearance of melasma, hyperpigmentation, wrinkles and rejuvenation of aging skin with great results. Visit deppatch.com for more product information, videos and quick tutorials for the eye patch system and face mask.For more information on how to add dĒp Patch™ treatments to your medical spa or day spa and wholesale pricing, please contact us or call 888-775-0595. The manufacture gives a quarterly donation to the cause Snow Leopard Trust.